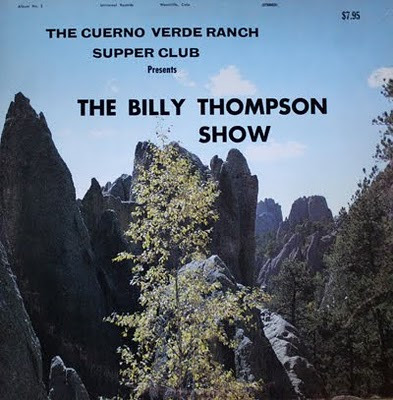 In the early 1970s, Billy Thompson and his wife Katie were burned out from the daily grind of touring from town to town. Looking to settle down, after a country music career spanning some three decades, the couple moved to Colorado and set up shop at the King's Loft in Aurora. 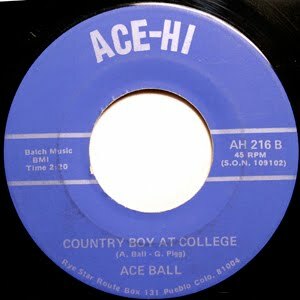 After packing in crowds there (along with visually-impaired singer/guitarist Ray Cobb, drummer Mike Turner, Steve McCaskey on bass fiddle, and guitarist Ronnie Miller) they got the call from the Cuerno Verde Ranch to bring their act down south. Located 10 miles south of Westcliffe, and sprawling across 4000 acres, the club attracted tourists to its sauna baths, tennis courts, rodeos and abundant wildlife. Known also for its nightly live music, nabbing Thompson, who was previously the longtime guitarist for Hank Thompson (no relation) and the Brazos Valley Boys, would have given the club a star draw. 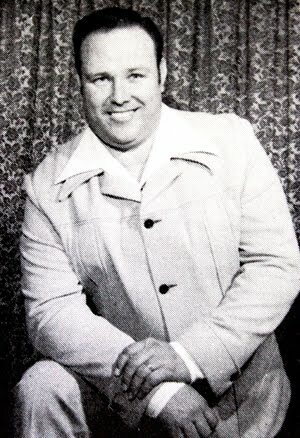 Thompson started his musical career with the West Texas-based Melody Cowboys (along with Red Hayes, Troy Jordan, Donnie McDaniel, Bobby McBay, Havey Grosman and Lloyd Jordan) , who became regulars on the Wichita Falls-based Sam Gibbs Orchestra Service tour. 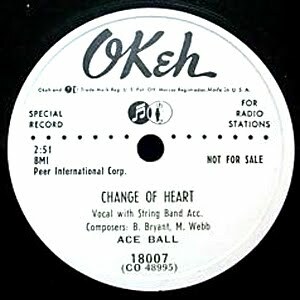 The band (who later morphed into the Melody Ramblers), and Thompson as a solo act, recorded for the Odessa Bo-Kay label (104 - "Love Gone Blind" / "Waltzing with Sin" and 115 - "Oh Lonesome Me" / "Worried Over You"), and in 1960 on Slim Willet's Winston label (Winston 1048 - "I Should Have Told You"). 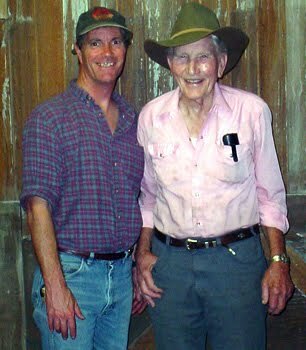 (For a wonderful archive of Billy Thompson photos, visit Jim Loessberg's Pedal Steel Guitar site). 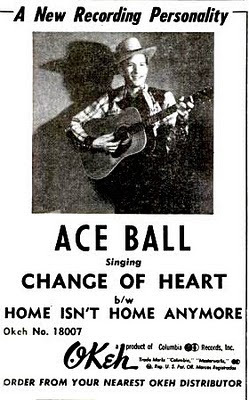 It was during this time that Billy met Katie Jean, who sang for Bob Wills - who at the time was managed by Sam Gibbs. While his King's Loft bandmates Cobb, Turner and McCaskey decided to stay put in Denver, the couple enlisted Jimmy Dee on drums to accompany Ronnie Miller for the Cuero Verde Ranch gigs. 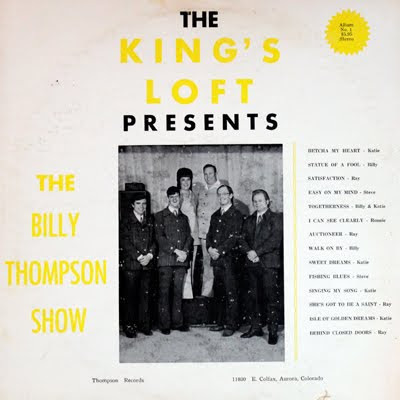 The Thompsons then re-released their King's Loft LP with a different album cover for their Cuerno Verde Ranch audience. Both albums feature the same 14 song line-up, recorded live (at the King's Loft). Listen to "Betcha My Heart"
Listen to "I Can See Clearly Now"
Billy Thompson died September 16, 1989. 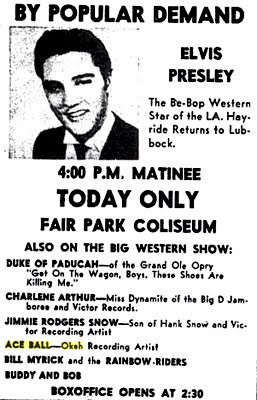 He was inducted into the West Texas Music Hall of Fame. 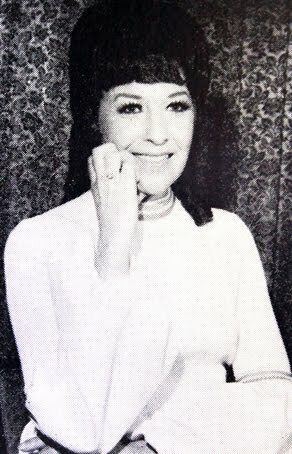 Katie Thompson was inducted in the Western Swing Music Society of the Southwest Hall of Fame in 2003. 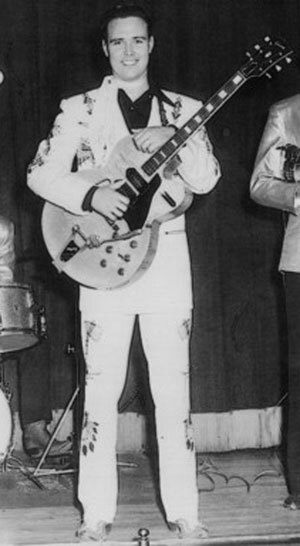 Ronnie Miller went on to play with Charley Pride. 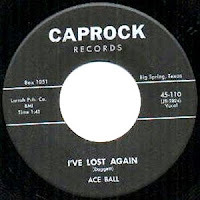 Jimmy Dee was inducted into the Rockabilly Hall of Fame, for his own 1950s and 1960s recordings. His whereabouts are unknown. Thanks to Dorothy and Larry Balch. 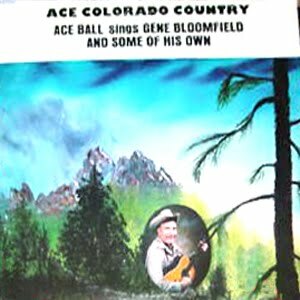 Additional information used with kind permission from Peter Burg, Pueblo Songwriters and Musicians newsletter, Notes (July-August 2003). 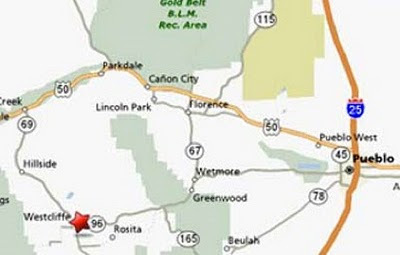 In 1968, Arthur Chester Balch, his wife Dorothy, and their young family packed up their belongings and left their longtime home in West Texas for Pueblo. The move had to have been difficult. Balch was a big fish in a little pond in West Texas. Known professionally as Ace Ball, he was a popular disc jockey (in Levelland, Lubbock, and Big Spring) and country music performer. 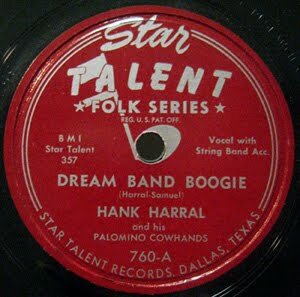 For almost two decades previous he was a member of Hank Harral's Palomino Cowhands, recorded for the Dallas-based Star Talent label, a solo artist on the Okeh and Caprock labels, and shared the stage with Elvis Presley and Waylon Jennings. His elderly parents had previously moved to nearby Cañon City, and family obligations forced him to trade the West Texas arid plains for the Steel City. He took a job with local country radio station KPUB. 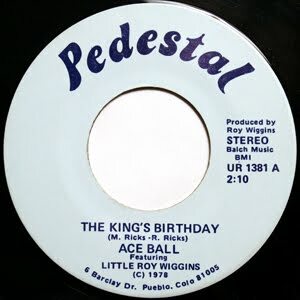 While in Colorado he picked up where he left off and went back into the recording studio, producing songs on his own Ace-Hi and later Pedestal record labels. 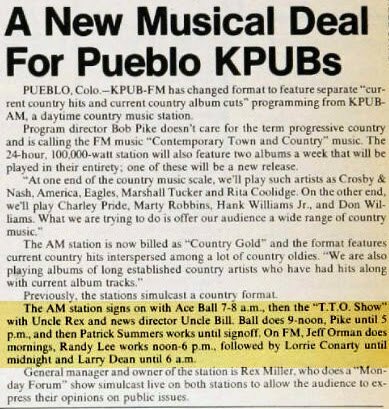 After almost 20 years at KPUB he moved across town to KIDN, where he hosted a weekly Saturday night show. In 2004, after performing at a local senior center, he fell down a flight of stairs and sustained a fatal head injury. He was 84. Hornet (1984-1985?) 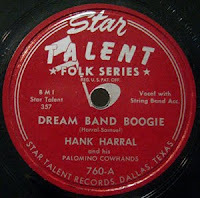 HR 1016 - "Overnight Sensation"/"Thank You Darlin"